Questions have also been raised as to whether the drilling fluids can even be treated to reach safe drinking water standards. Each Marcellus well produces approximately one million gallons of waste water that must be treated. Municipal treatment facilities have encountered trouble when trying to treat the wastewater because it can be up to 10 times as salty as sea water, and Pennsylvania may not currently have enough treatment facilities to deal with all of the waste water being produced by hydraulic fracturing. 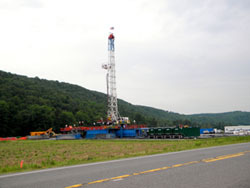 Yet again, it seems that the state was not ready for the Marcellus Shale gas industry to move in this quickly. The impact of Marcellus drilling is key to the future of the Susquehanna watershed because 72 percent of the basin lies over Marcellus Shale. Andrew Gavin, a water quality specialist for the SRBC, discussed with me the impact of shale drilling in the basin and efforts the SRBC is taking to monitor changes. This summer, the SRBC installed a new water quality monitoring system to gather real-time data on the temperature, pH, conductance, dissolved oxygen and turbidity of small rivers and streams in areas of natural gas drilling. The stations require maintenance every six to eight months at which time additional water samples will be taken for further analysis. The system emerged because there was a gap in monitoring high quality, headwater streams. In total 30 stations are being established with some in areas of high natural gas activity such as near well pads, treatment facilities and transport areas. Other stations will be set up in areas free of natural gas drilling to get baseline data. It is the first comprehensive system to be installed in the basin. The monitoring system can generate a warning signal in response to changes in the stream water and notify DEP. Carl Kirby, Professor of Geology at Bucknell University, is modeling how the water chemistry of the Marcellus Shale changes throughout the drilling process. He and his student researchers are also determining a parallel method of stream monitoring similar to that of the SRBC. Because frack water is so salty, through measuring conductance of streams, they should be able to determine if a Marcellus leak has occurred. The research he is doing provides strong evidence that the SRBC’s monitoring system will prove effective, although again the state has lagged behind the drilling boom. While the SRBC’s water quality system can comprehensively monitor changes in streams and small rivers, there is no such system in place to monitor groundwater changes. However, the University of Penn State Extension is monitoring the water of 60 wells before, during and after the drilling process. An additional 200 wells will be monitored only after the drilling has occurred. The goal is to identify any changes in the groundwater that result from the drilling and to determine what aspects of the drilling are more likely to result in water changes. This information can then be used to help regulating agencies like the DEP determine what kinds of regulatory changes may benefit the natural gas drilling process. The DEP has expressed interest in setting up a groundwater monitoring system but no action has been taken to do so due to a lack of resources to initiate and maintain such a system, noted Andrew Gavin of the SRBC. Even with such difficulties, environmental impacts of natural gas drilling can still be easier to quantify than the social impacts in Susquehanna County. Vera Scroggins, Montrose resident and environmental activist, depicted how two perspectives on natural gas drilling emerged within her community. As a leading member of the group Citizens for Clean Water, she has produced several public access videos on natural gas drilling. At our first encounter, she directed me to multiple drilling sites in Dimock, showing me houses along the way that had been impacted by the natural gas migration. Each site flaunted a small tower over a well to release the natural gas in order to prevent a pressure build up and possible explosion. As an activist, Vera had been present as spills, interviewed those impacted by natural gas in their water supply and has researched a number of aspects of hydraulic fracturing including the final disposal of wastewater from the sites. The incident that had the most profound effect on Vera was a spill that she and a few other activists videotaped. At the top of a hill on a gravel well pad they saw a thick, black liquid that had spilled and was trickling into a nearby wetland. When approached by the company workers on the site, she began to tell them of her concerns but they seemed uninterested and asked her to leave. “It was like two sides of the pendulum. Complete opposites. They’re at one end and we’re at this other end. We’re like a chasm away and we’re talking together but don’t see eye to eye at all.” This divide expanded throughout the community, she said. There are those who are making money and those who aren’t. There are those who think drilling is great for the community and those who think drilling will only bring harm. One of the greatest benefits the natural gas drilling has brought to the area is the influx of businesses gaining customers. Gas stations are selling more fuel than ever before. Farm supply stores are selling fertilizer for reclamation efforts. Auto part stores are selling everything from tires to tune ups. Hotels and rentals are booked. Even bars and restaurants are experiencing a boom. Some contracting and drill site jobs have been created as well but often require grueling hours, long-distance travel, and exposure to many hazards. To some, natural gas is part of the solution to decreasing dependence on foreign oil. To others, natural gas is a profit maker. To farmers, it’s a chance to keep their land and possibly make some much-needed money off of it. To environmental activists, it’s just another dirty method of energy production bound to leave a large footprint on local ecosystems. Political decisions are supposed to be objective and thus take these perspectives out of the equation, but many in Dimock still wonder whether the public sector is providing them with all the information they need. At the Lewisburg Fourth of July parade last summer, I approached U.S. Rep. Chris Carney, who was marching in the parade, for an interview, after having had difficulty getting any comment from him or his office on Carney’s neighborhood in Dimock and Marcellus regulatory issues. Amid all the American flags and patriotic bands and floats, the then-congressman offered to talk after the parade but asked me to carry a banner for him in the march. When the brass bands ended, the march was over, and the banner stowed away, he was still too busy to talk and drove away.